Merseyside Police have launched an investigation over footage of Liverpool star Mo Salah driving whilst using his mobile phone. Salah got his 2018/19 campaign off to the perfect start by scoring the opener in the Reds' 4-0 victory over West Ham United at Anfield on Sunday afternoon. 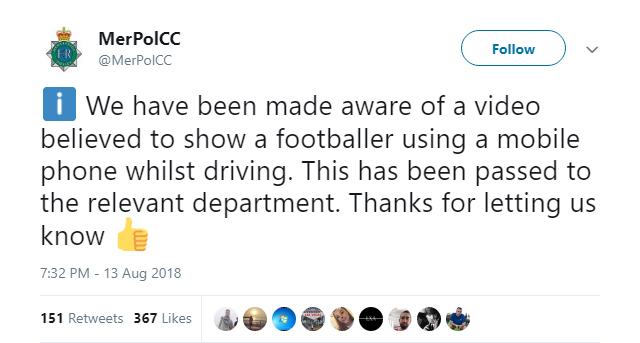 The Egyptian international, though, has come under fire after footage was posted on social media which shows him using a mobile phone whilst driving. The footage, which is believed to have been taken after Sunday's match, shows Salah using his phone at the wheel and then driving off whilst being pursued by selfie-hunting Liverpool fans. Under UK driving laws, it is illegal to use a handheld mobile phone when driving - even whilst stopped at traffic lights or queuing in traffic. Merseyside police have confirmed that they have received reports of the video and have passed it on to the relevant department. Liverpool have confirmed they are aware of the footage and are in contact with the police in an attempt to resolve the matter. The club, after discussion with the player, have made Merseyside Police aware of the footage and the circumstances surrounding it's capture. We have spoken to the player also and will deal with any follow-up internally. Neither the club or player will be making any further comment on this matter.